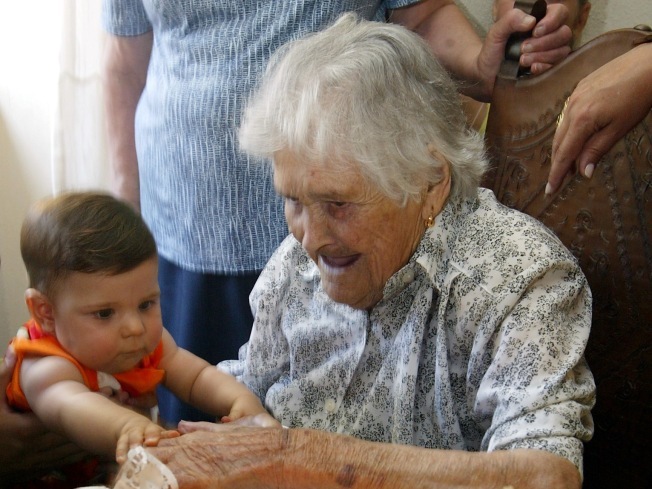 In this Sept. 10, 2006 file photo Maria de Jesus, is touched by Berenice, her eight month old great-great granddaughter as she celebrated her one hundred and thirteen year birthday in Corujo, Portugal. LISBON, Portugal — A Portuguese woman who lived to see five of her great-great grandchildren born and was believed to have been the world's oldest person died on Friday at the age of 115, officials said. "I regret the death of this lady, she really was the sweetest person," town councilor Ivo Santos said in Tomar, central Portugal, 84 miles north of Lisbon.